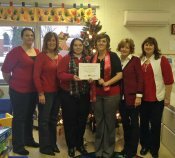 The Elizabeth Lee Black School keeps rising in the Keystone STARS program. Now, they are at four stars. This incredible accomplishment was made possible with hard work from Nina Wolfarth, Stephanie Lorei, Cherie Rouse, Carrie Morgan, and Stephanie Robertson, and with the support of Agnes Jell, STARS Manager. Four stars is the highest level an early child care provider can receive. The levels are based on quality standards in four key areas: staff education, learning environment, leadership and management, and family and community partnerships. Congratulations to our staff and we appreciate all your hard work.